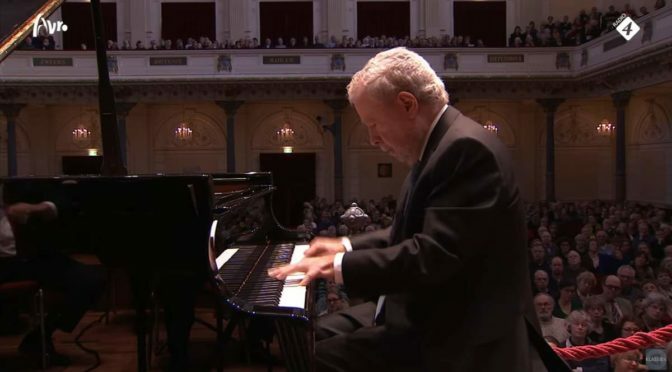 Accompanied by the Netherlands Radio Chamber Philharmonic Orchestra (Radio Kamer Filharmonie), Brazilian classical pianist Nelson Freire performs Robert Schumann’s Piano Concerto in A minor, Op. 54. Completed in the year 1845, is the only piano concerto written by the German Romantic era composer. Conductor: Michael Schønwandt. Recorded on Sunday, February 10th, 2013 at the Main Hall of the Concertgebouw in Amsterdam. Published by AVROTROS klassiek. In 1841, Schumann wrote a fantasy for piano and orchestra, his Phantasie. His pianist wife Clara urged him to expand this piece into a full piano concerto. In 1845 he added the intermezzo and finale to complete the work. It was the only piano concerto that Schumann completed. The work may have been used as a model by Edvard Grieg in composing his own Piano Concerto, also in A minor. Grieg’s concerto, like Schumann’s, employs a single powerful orchestral chord at its introduction before the piano’s entrance with a similar descending flourish. Sergei Rachmaninoff in turn used Grieg’s concerto as a model for his first Piano Concerto. There are three movements – there is no break between these last two movements (attacca subito). Attacca is the Italian command form of “attack,” and is an indication to move immediately to the next movement without a pause; a seamless transition into a movement or passage.